Below are reports of Hethersett's annual village Remembrance Event going back to 2007. They are taken from the news archive section of the Hethersett Village Web Site and reproduced with the permission of the editor. Visit the web site to see many more photographs from the events held over the past eight years. 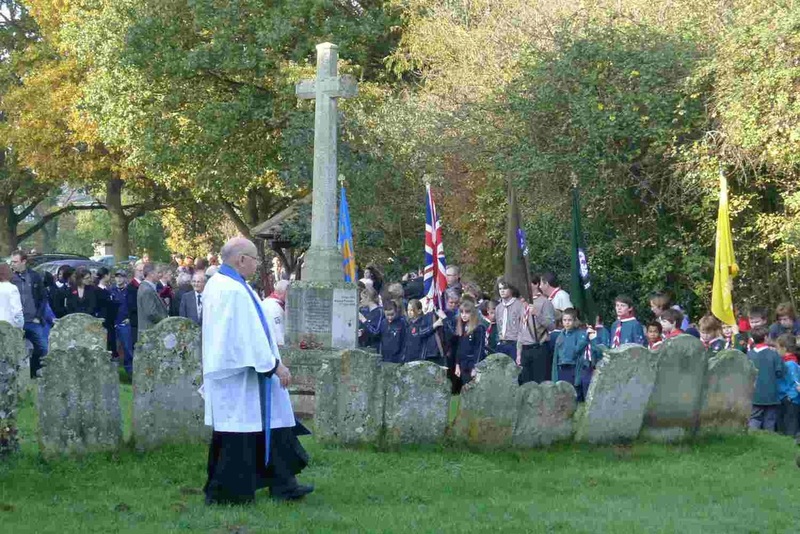 THE annual Remembrance Service at Hethersett was organised once again by Hethersett and District Churches Together. Churches from Hethersett, Little Melton and Great Melton combined at St Remigius Church with wreaths being laid on the war memorial by representatives of the churches and uniformed organisations. The Last Post was sounded by a member of the Royal British Legion. The names of those who died in the two world wars were read out by Duncan Pigg for Hethersett, Maggie Murrell for Great Melton and Fiona Doonan for Little Melton. The Act of Remembrance inside the parish church was led by the Rector, the Rev Di Lammas, and a special remembrance day sermon was preached by the Archdeacon of Norfolk, the Venerable David Hayden. Work to further commemorate the war dead in a special booklet is progressing with a publication date to co-incide with next year’s Remembrance event. HETHERSETT'S annual Remembrance Service had added meaning this year - not only remembering the 90th anniversary of the end of World War One but also marking the launch of The Hethersett War Memorials 1914-1920 - a 48-page booklet from Hethersett Society featuring men from the village who fell in the Great War. Below we hope to capture some of the atmosphere of a special day for the village, starting with the two minutes' silence around the war memorial in the grounds of St Remigius. Hethersett Explorer Scouts, Hethersett Scouts, Hethersett Guides, Hethersett Cubs, Hethersett Beavers, Hethersett Brownies, Hethersett Parish Council, Hethersett Parish Church, the Roman Catholic Church, Hethersett Methodist Church, Hethersett Pensioners’ Association and Hethersett Old Hall School. Inside the church the service of remembrance was led by Duncan Pigg with Hethersett Methodist Minister The Rev Derek Grimshaw delivering the sermon on the importance and symbolism of poppies worn during the remembrance period. Two of the hymns featured in the service – “Jesus Lover of My Soul” and “How Bright Those Glorious Spirits Shine” - were sung at the dedication of the village war memorial in the church’s grounds on 11th July, 1920. Other hymns sung included "Thy Hand O God Has Guided," "O God Our Help in Ages Past" and "Now Thank We All Our God." Bible readings were by John Head, representing the parish church, and Pauline Cubitt representing the Roman Catholic family. Prayers of Intercession were led by Anne Steward from Hethersett Methodist Church. Following the service the newly published Hethersett War Memorials booklet was officially launched with a reception including wine and food supplied by Waitrose store of Wymondham. The 48-page booklet commemorates heroes from Hethersett who died during the First World War and has been put together with the help of grants from the Norfolk Rural Community Council and Hethersett Parish Council. It was researched and written by local historians Bea Ewart and Bob Andrews and brings to life the lives of those featured on the village war memorial who died during the First World War. The book also describes the village as it was in 1914 and at the time of the dedication of the war memorial in the grounds of the parish church in 1920. It underlines the sacrifices made by local men, giving biographical details both about them and their service. Chris Barringer, president of Hethersett Society, reflected on those featured: “It is appropriate to launch the booklet on the 90th anniversary of the end of the First World War. It is a very well researched project and many of those featured in its pages will have worshipped in this church,” he said. Co author Bea Ewart lost a grandfather in the war and wanted to record for posterity the lives of local men who also died. “The booklet was a collaboration between myself and Bob Andrews and a team of volunteer researchers. It was a very enjoyable thing to do and helps us to realise the ultimate sacrifice these brave people made. There are many tours organised to the battlefields and this all helps to bring home the reality of the conflict,” she added. Those present at the launch included 97-year-old Mary Ransley, who grew up during the war and now lives in Hethersett, and Jenny Pigg and Yvonne Thrower whose grandfather Frederick Curson died from the effects of mustard gas and is buried in Rouen. A limited number of booklets will be available for sale at £3 from various outlets in the village. A new name has been added to Hethersett’s war memorial in the grounds of St Remigius Church. Norman Folkard was a sergeant serving with the Royal Norfolk Regiment (now the Royal Anglian Regiment). He was killed on September 1st, 1956, during the Cyprus Emergency, when a vehicle in which he was travelling left the road and went down a ravine. Sgt Folkard was buried in a cemetery in Nicosia, but up until now his name has not been included on the Hethersett War Memorial although it has been read out at a number of Remembrance services. Now that has changed and he has his own spot on the memorial. 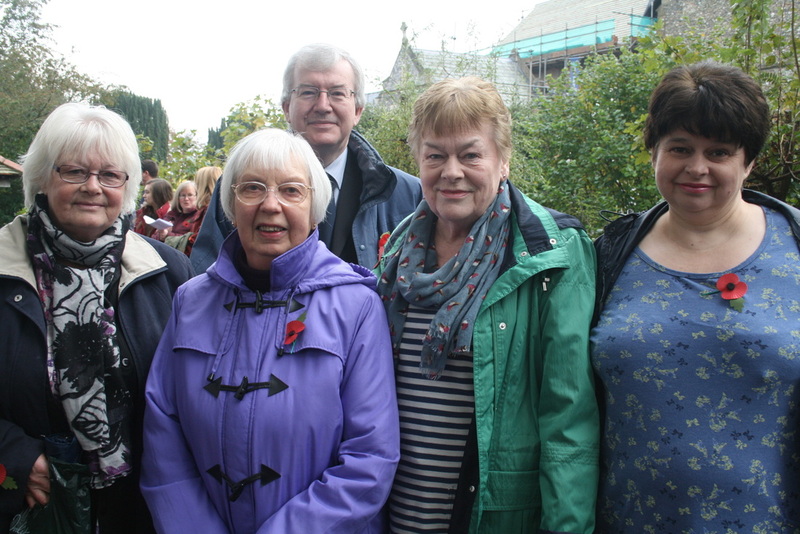 He was remembered on Sunday alongside those from the village who died in the two world wars. A list of those fallen was read by St Remigius Church Reader Duncan Pigg who also led the Remembrance Day service inside the church after the customary two minutes’ silence had been observed outside. A wreath in memory of Sgt Folkard was laid by Lt Col Paul Garman who was a colleague and a fellow sergeant at the time of Norman’s death. Also in attendance for the special day was Major John Denny who was the company sergeant major in 1956. It was a poignant day for Sgt Folkard’s sister Mrs Gay Payne who now lives at Hingham. She was just 12 when her brother was killed at the age of 22. “I am so pleased that his name has been added to the Memorial. It is a fitting tribute,” she said. Sgt Folkard also has a brother who is currently living in Australia. The remembrance service also co-incided with the unveiling of a memorial in Cyprus to mark the 50th anniversary of the end of the emergency. Wreaths were also laid at the Memorial by the chairman of Hethersett Parish Council, Fred Watkins, and representatives from the Methodist Church, the Parish Church, the Roman Catholics and a number of uniformed youth groups including the Guides, Scouts, Brownies and Cubs. Inside the church the Remembrance Day Sermon was preached by the Venerable Martin Gray, former Archdeacon of King’s Lynn. The prayers of intercession were led by Mrs Jackie Baker and the Act of Commitment was led by Mrs Vic Redington. HETHERSETT St Remigius Parish Church was packed for the annual Remembrance Sunday service organised by Hethersett and District Churches Together. The service began with a procession of uniformed organisations through part of the village and an act of remembrance around the war memorial in the grounds of the church. Warm rather unseasonal weather met those laying wreaths in remembrance of Hethersett residents who lost their lives in the two world wars and also the Cyprus campaign of the 1950s. Following the sounding of the Last Post, two minutes’ silence and the Reveille, the service moved inside the church where it was led by the Rector of Hethersett, the Rev Di Lammas, who based her sermon around the work of war poets, both from the World Wars and the modern day conflicts in Iraq and Afghanistan. THE traditional Hethersett Remembrance Sunday parade and memorial service took place on a glorious sunny autumn morning. 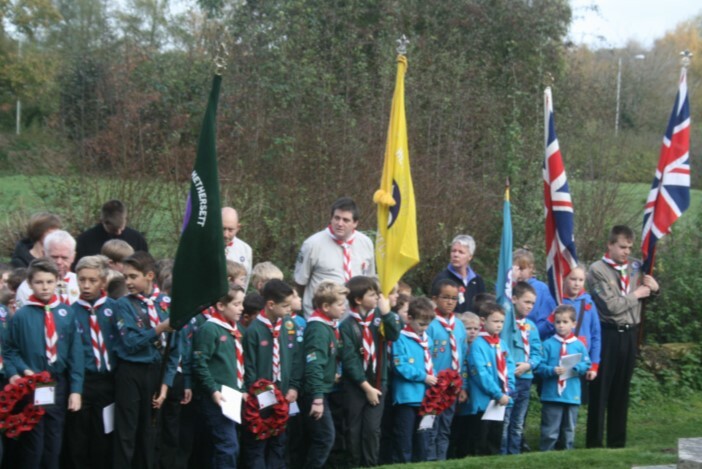 The Guides, Scouts, Brownies, Beavers and Cubs marched slowly from the centre of the village to the church, carrying the Union flag and their own standards. They were met at the War Memorial in the St. Remegius churchyard by residents of all ages. A dedication to the fallen of the village was then led by Duncan Pigg, who read out the names of men who had died during the two world wars and the Cyprus campaign. There followed two minutes' silence, the start and end of which was marked by a lone bugler playing the Last Post. The youth organisations, schools, pensioners' association, other village churches and the Parish Council then laid wreaths on the memorial, and each in turn saluted in their own distinctive way. A Remembrance service in the church followed at the end of this moving ceremony. 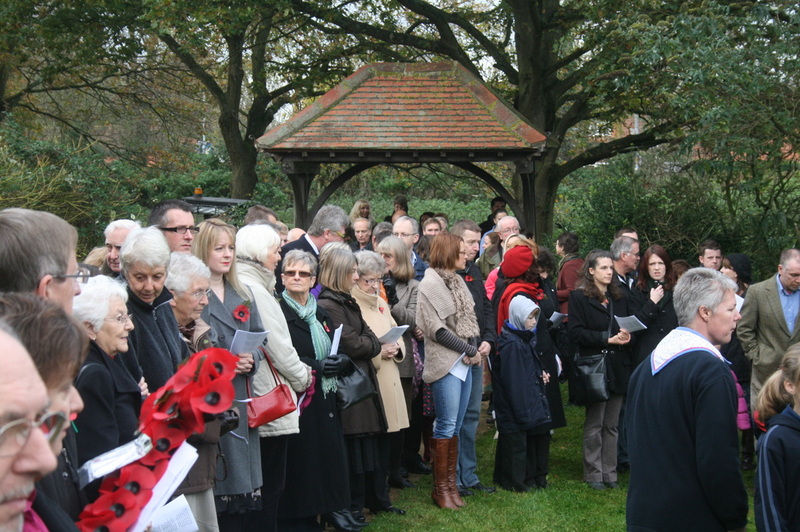 HETHERSETT Parish Church was full for the 2012 Remembrance Sunday Service held on November 11th. The service was preceded by two minutes' silence - fittingly at 11 a.m on the 11th day of the eleventh month - and the laying of wreaths on the village war memorial. The Guides, Scouts, Brownies, Beavers and Cubs marched to the church from the centre of the village. Duncan Pigg once again read out the names of those who had died during the two World Wars and also the Cyprus campaign prior to the last post being played. Wreaths were laid by representatives of the youth organisations, the pensioners association, schools, Hethersett Parish Council and churches. Inside the church the service of remembrance was led by The Rev Canon Graham Drake who spoke of the need to remember the men who had given the ultimate sacrifice for "truth, justice and freedom." He also pointed out that the day marked the official last day of Hethersett's Rector the Rev Di Lammas who officiated at her final village service at the end of September. The service featured Bible readings from church warden Rick Palmer and chair of Hethersett Parish Council Fred Watkins. The act of penitence was led by John Head and Intercession was led by Mrs Jackie Baker. At the conclusion of the service the church choir sang "They Shall Not Grow Old" to a musical setting by Douglas Guest of the war poem by Laurence Binyon. HETHERSETT Parish Church was once again full for the 2013 Remembrance Sunday Service which was preceded by an act of remembrance around the war memorial with village stalwart Duncan Pigg reading out the names of those who had died during the two World Wars and also the Cyprus Campaign of the 1950s. This was followed by a minute’s silence, the last post and the reveille. 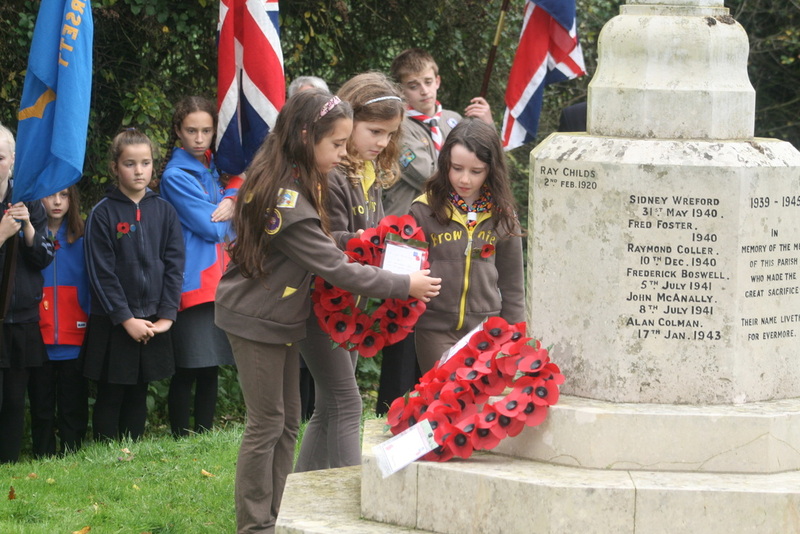 The Guides, Scouts, Brownies, Beavers and Cubs were all represented and laid wreaths on the war memorial. Wreaths were also laid by Hethersett Parish Council chairman Fred Watkins and representatives from local organisations including Hethersett Pensioners’ Association, the Roman Catholic community, Hethersett Parish Church, Hethersett Methodist Church and Hethersett Old Hall School. Inside the church, the service of remembrance was led by The Rev Christopher Mallett who spoke on the themes of war, hatred, peace and love. Bible readings were given by churchwarden Rick Palmer and Fred Watkins and Margaret Ford, representing Hethersett Methodist Church, led the prayers of intercession. At the conclusion of the service the church choir sang "They Shall Not Grow Old" to a musical setting by Douglas Guest of the war poem by Laurence Binyon. Pictured are left to right - Heather Undrill, Bea Ewett, Bob Andrews, Valerie Hearn and Pamela Hearn. THE 2014 service of remembrance in Hethersett was a special occasion for more than one reason. It commemorated the 100th anniversary of the start of the First World War and the 75th anniversary of the beginning of the Second World War and also provided a special and poignant time for three visitors. For the first time this year, the name of Ray Childs was read out amongst those who fell in the First World War. His name was added to the other 17 from the Great War earlier in the year during a clean-up of the memorial and following a campaign by village historians Bea Ewart and Bob Andrews. Those joining with uniformed organisations and villagers around the memorial included Ray’s great nieces Heather Undrill and Valerie Hearn and his great great niece Pamela Hearn who had travelled from Mundesley and Scottow for the service. They expressed themselves “absolutely delighted at the marvellous memorial” to their relative. Ray’s name was added to the war memorial this year after the go ahead from Hethersett Parish Council. Ray was severely gassed during active service in France in 1918 and died in Hethersett after the war. Heavy overnight rain failed to deter the determination of local people and uniformed organisations to gather around the memorial in the grounds of St Remigius Church, despite the fact that the church is still shut for repairs to its roof which are now expected to last until the end of November. That meant a change to the usual plan with the remainder of the united service being held in Hethersett Methodist Church. Brownies, Guides, Scouts and other uniformed organisations were present at the War Memorial with Duncan Pigg B.E.M reading out the names of villagers who died during the two World Wars and also during the Cyprus campaign of the 1950s. Wreaths were laid by numerous village organisations including Hethersett Pensioners’ Association, Hethersett Methodist Church, the Roman Catholic Community, the Royal British Legion, Hethersett Parish Council, Hethersett Brownies, the First Hethersett Scouts, the First Hethersett Cubs, the Second Hethersett Guides, Hethersett Beaver Scouts, the First and Fourth Hethersett Brownies and Hethersett Old Hall School. The service of remembrance at Hethersett Methodist Church was led by the Rector, the Rev Derek McClean, and the Methodist Minister, the Rev Matthew Olanrewaju. The uniformed organisations presented their colours to a full church. HETHERSETT Parish Church was full for the annual Remembrance Sunday Service. The service began around the war memorial with the roll call of those who lost their lives in the two world wars and the Cyprus campaign being read out by Duncan Pigg. A minute's silence was observed and the Last Post and Reveille were sounded. Wreaths were laid by a number of local organisations including the Roman Catholic Community, Hethersett Parish Council, Hethersett Pensioners' Association, the RAF, 1st Hethersett Scouts, Hethersett Methodist Church, 1st Hethersett Cubs, 2nd Hethersett Guides, the 1st and 4th Hethersett Brownies, the 1st Hethersett Beavers, Hethersett Parish Church and Hethersett Old Hall School. The service of remembrance continued inside St Rimigius and was led by the Rector, the Rev Derek McClean and included traditional Bible readings and hymns and the National Anthem. The youth uniformed organisations from the village were well represented. A packed Hethersett Parish Church honoured the village’s war dead at the annual Remembrance Sunday Service. ​The special service of remembrance began around the war memorial with village stalwart Duncan Pigg reading out the names of those killed in the world wars. This was followed by the sounding of the Last Post, followed by the laying of wreaths by representatives of many of the village’s churches and other uniformed organisations. This year these included: Hethersett Scouts, Hethersett Guides, Hethersett Cubs, Hethersett Beavers, Hethersett Brownies, Hethersett parish Council, Hethersett Parish Church, Hethersett Methodist Church, Hethersett Roman Catholic Community, Hethersett Pensioners’ Association and Hethersett Old Hall School. The remembrance service inside the church was led by the Rector of Hethersett, the Rev Derek McClean and the Methodist Minister the Rev Matthew Olanrewaju. A collection was taken on behalf of the Royal British Legion.